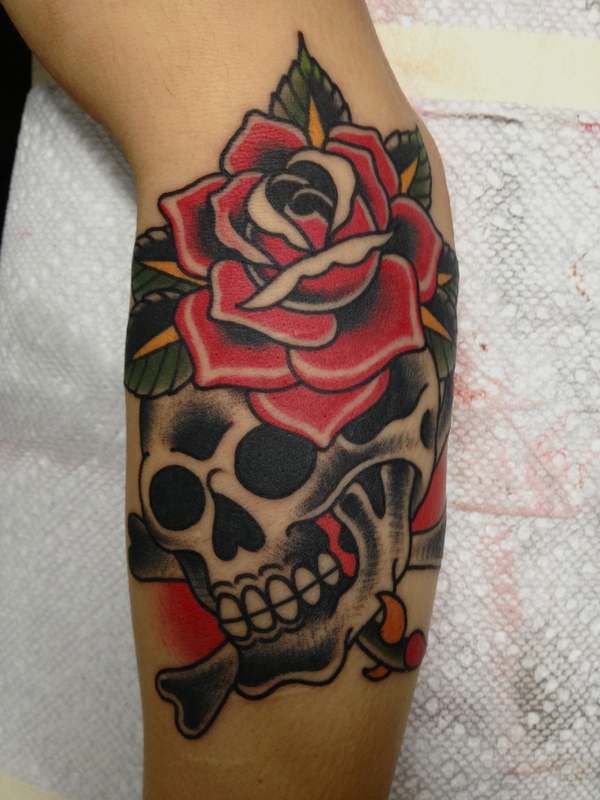 These are some newer tattoos of roses. 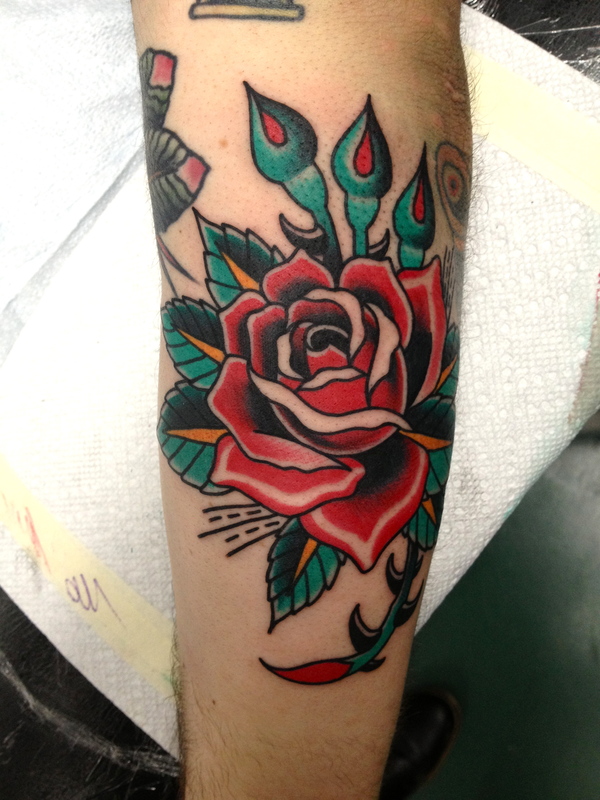 Everyones always told me I do nice roses, but I honestly never believed them. I feel that its only recently that I’m starting to really understand roses. 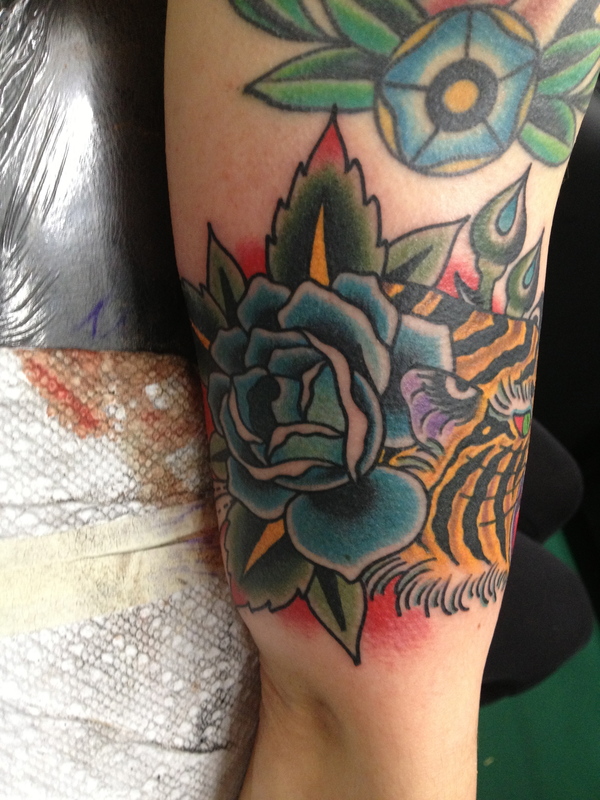 I’m going to keep working hard to make sure my rose tattoos are the best I can possibly do. Hey gang. Sorry it’s been so long, I’ve been pretty busy. 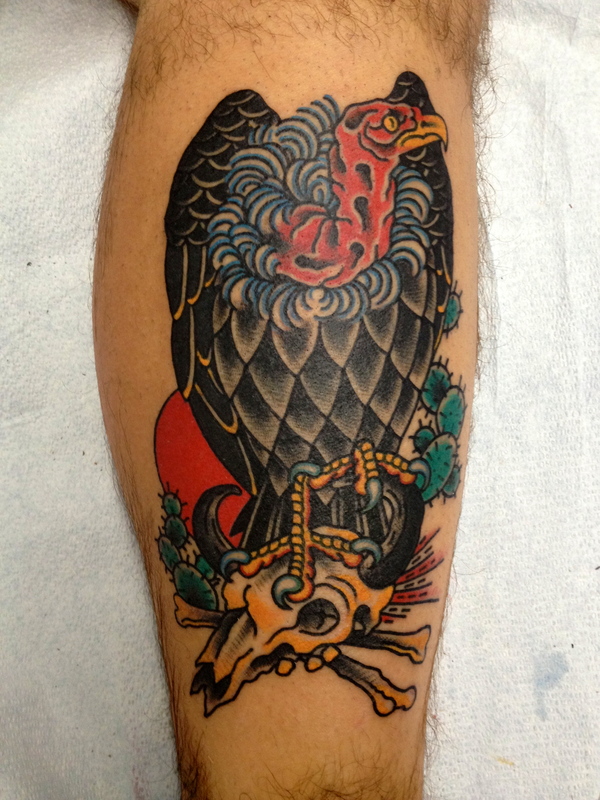 Here are a few new Japanese tattoos (and semi-Japanese tattoos) that I’ve done. The dragon is done in kind of an Americana style, which is nothing new to me. 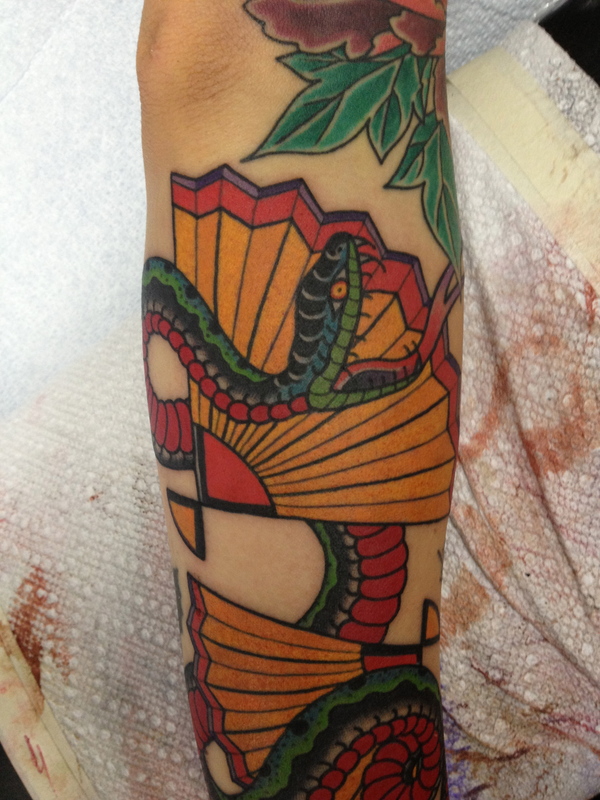 The snake and hand fans is done in the same blend of styles. I think I’ll add a pattern or something in the fans on her next visit, which is probably one of the few times I would outline with a color. 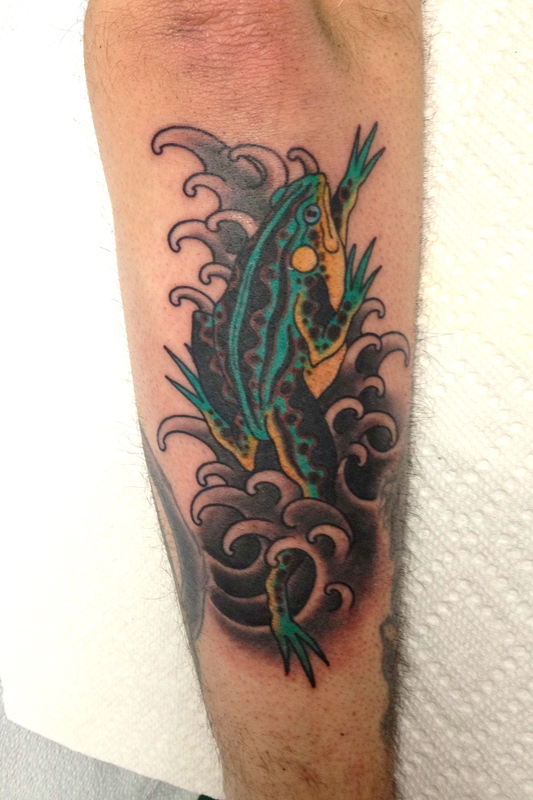 That one I consider to still be in progress, but the frog below that was a cool one-shot tattoo. 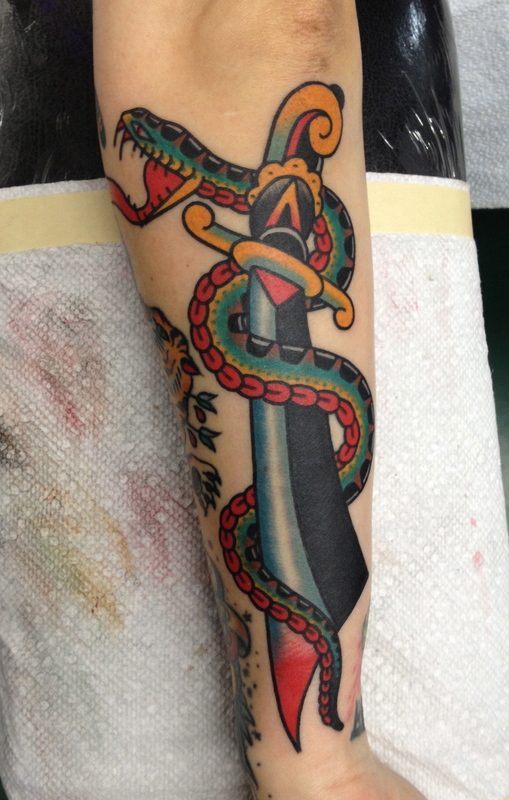 And last but not least is my friend Kayleigh’s leg which I just finished. I’ll probably get a better shot of it once its all healed and settled. 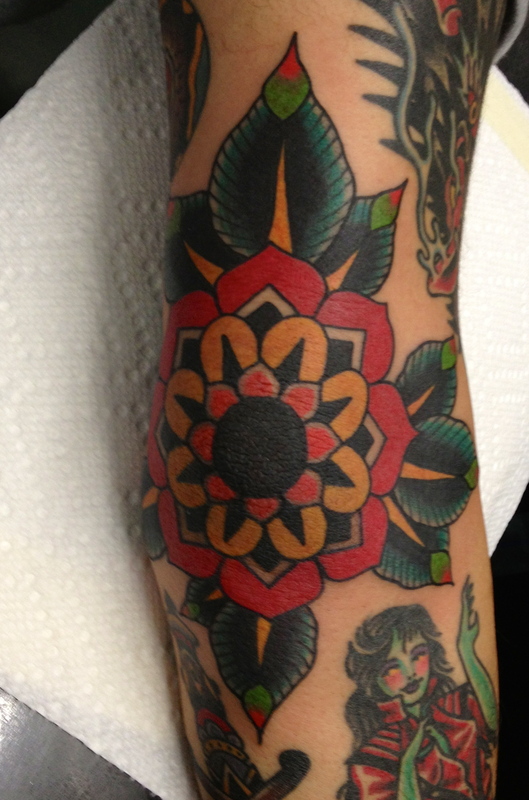 Here are a few new traditional tattoos that I’ve recently done. This kind of stuff never gets old. I’m expecting to get some nice healed photos of these things, but its been too long since I’ve updated, so I didn’t want to wait any longer! These tattoos are all from the last few days. I think the cobra came out really cool, you cant go wrong with red and black. The moon and pumpkin tattoo was from one of the halloween sketches I did a couple months ago. It would’ve been done by halloween if hurricane Sandy didn’t roll through, but it’s better late than never. I drew the girl in profile a little different than how I usually do and I think it worked out well. Thanks for looking! Last weekend I took a trip to Austin to work at the world famous Rock Of Ages. 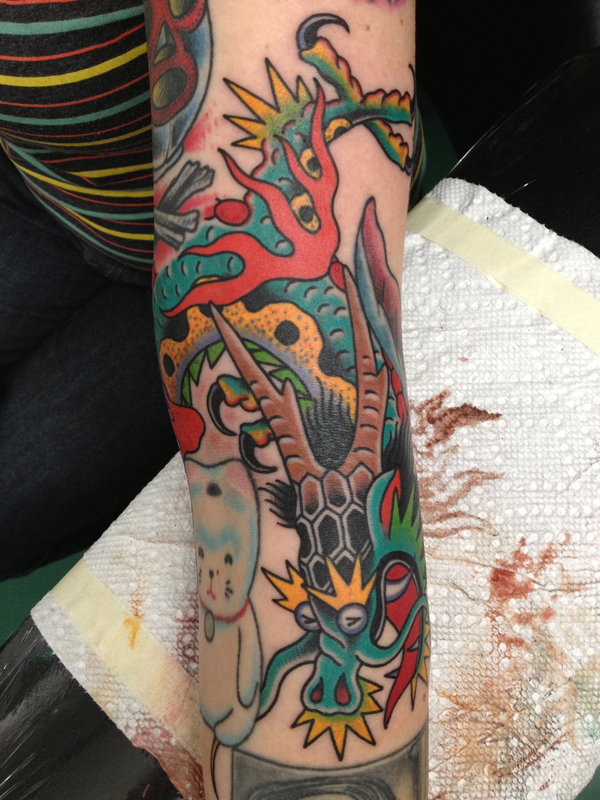 I was lucky to tattoo some great folks down there who had really good taste. I wish I could write a little bit about each of these, but I did so many cool tattoos over just one weekend that I would just be rambling for too long. 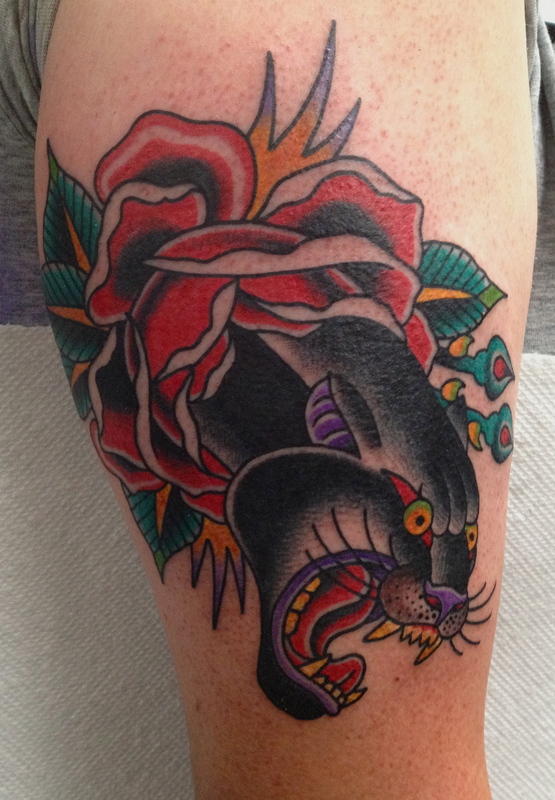 I want to give a huge ‘thank you’ to the staff of ROA, and to everyone who came out to get great tattoos and make my first trip to Austin worthwhile! 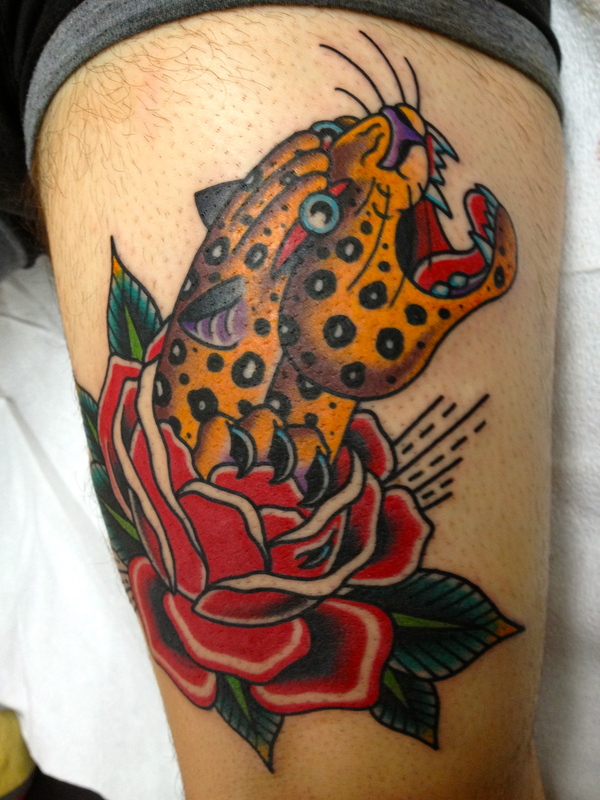 I’m hoping to make another trip down sometime, so if you’re a tat-curious Texan send me an e-mail! dHere is my newest batch of dames. The first witch is a little different for me because I don’t do black and grey very often, but I’d love to do more of it. It’s a lot of fun whenever someone comes up with a unique theme for their pin-up tattoo, and the detective girl was exactly that. Peter who got this tattoo had an amazing piece from Valerie Vargas a little further up his arm that had me sweating bullets. The second witch tattoo is the opposite from the first, I’m pretty sure I used every color ever on that sucker. Thanks for looking! 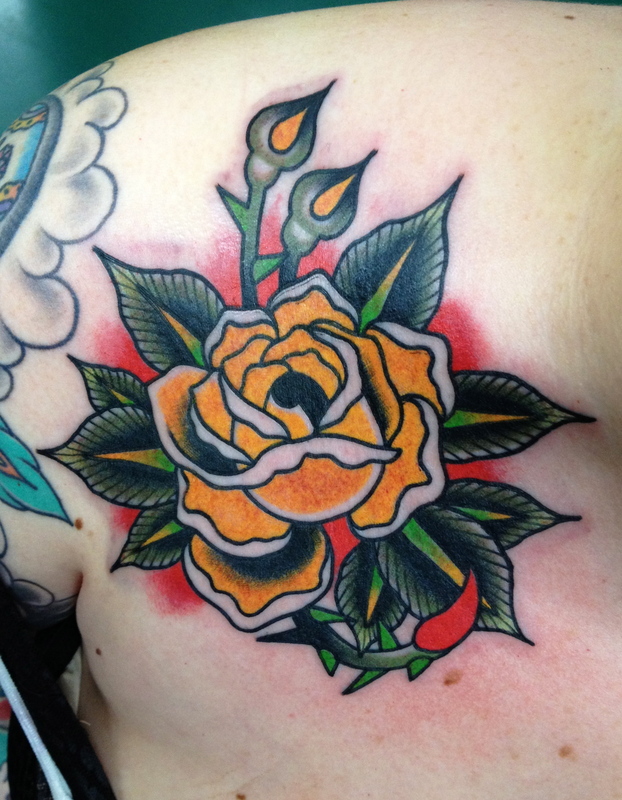 This rose is on my buddy Ashley Love. Ashley is a talented tattooer and I have no idea why she keeps getting tattooed by me. 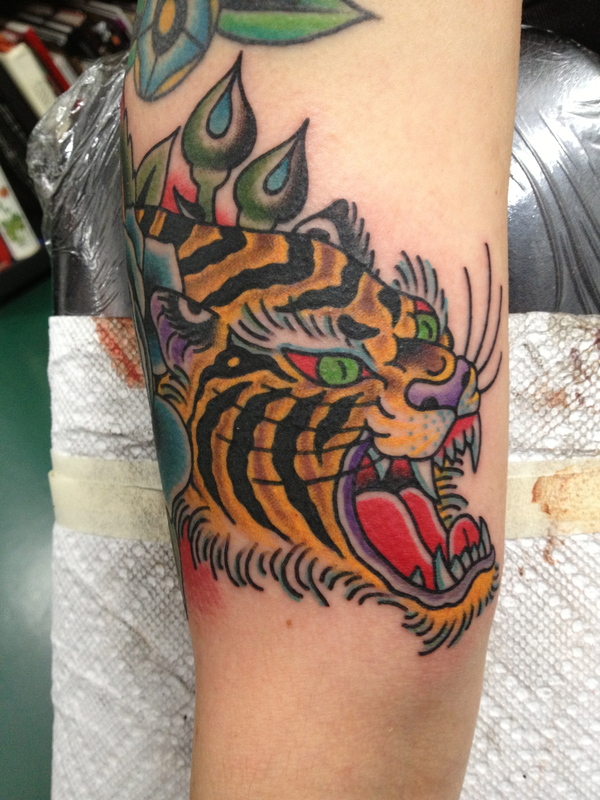 The tiger is on Leah, possibly my craziest regular customer. She always gets something cool after about a half hour of me assuring her that it’ll come out alright. God bless her.